Antique Bone China Query - Royal Stafford:- I acquired this set in the 1970's. It came from the estate of a woman who had died. She probably bought it some time in the 1950's. It is heavily gilded and is in perfect condition. There is also a gold handwritten number that is either 4629 or 4619 on the bottom. Also made in England Est. 1845. I attached the two pics you requested. I appreciate anything you can tell me about it and if it is valuable. Thank you. Nice pic, thanks. Beautiful set! Royal Stafford is a 'brand name' backstamp of an English company from Staffordshire called Thomas Poole. Not to be confused with "Royal Staffordshire China" (E. Hughes & Co), Royal Staffordshire Pottery (Arthur J. Wilkinson (Ltd) AKA Clarice Cliff) OR Crown Staffordshire (T.A. Green). Stafford China". This company was an amalgamation of the the two firms of Thomas Poole and Gladstone China Ltd. The mark of your set shown above comes from the era after 1952. Regarding your question as to its value, the first thing to say is I don't ever do valuations myself. Valuations for vintage and fine china are specialist niches requiring vast amounts of knowledge and research material. I'm just an enthusiast who's lucky enough to work in the industry. So whenever visitors ask me for a valuation, I send them straight to a page I've written especially to help you research what your porcelain wares or china collection might be worth. Can any one tell me about a bowl with the word cliff and a crown and Montreal and a small letter v mark? I have a whole set of dishes that were left to me by my mother. I have been researching them for at least 8 years with absolutely no luck. Today I found a very similar set but with a different name so now I'm totally confused. 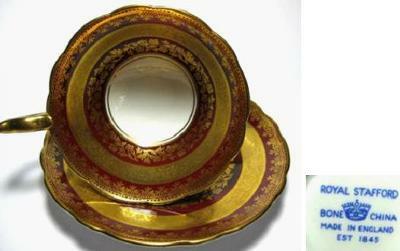 I have royal staffordshire pottery, royal ascot-empress but I found hampton to be very similar. Any information on the set would be helpful, my mom bought them from an old lady 50 years ago and we have NO information on them. Don't be confused - 'open stock' transfer print patterns were bought by many different Staffordshire companies and then given various pattern names. Royal Ascot was a brand of Soho Pottery (Ltd) later known as Smith & Binnall and later still Simpson Pottery. Hampton was a backstamp trade name of Swinnertons of Hanley. Also there are many different, but similar sounding Staffordshire firms. Royal Staffordshire was owned by A J Wilkinson (who made for Claris Cliff). Staffordshire Potteries (Keele Street Pottery - later bought out by Grimwades Royal Wintin). Hope this helps your confusion. I have a small plated signed N. Sand by Heritage Regency English Fine bone Chine. I cannot fine anything on this under that company, but did find Children Playing Music under Poole Pottery signed N. Sand. The only difference in the plates is the one under Poole has a stool with shhet music on it. How can I find out more information on N. Sand and his work. I have a tea set that I inherited with a Backstamp of Royal Stafford - Guaranteed English Bone China. The word "IRIS" in capital letters is noted which I assume is the pattern. Could you give me some idea as to when this was produced and by whom? I have a bunch of my great grandma and grandma's China. Mainly cups and saucers. Most matching but some loners. Can anyone recommend a website for me to place a $ value? Please and thank you.